I had a bit of a chuckle at “ease of use” and “latest popular software”. Ease of use compared to which distro? I had the strange feeling that this description hadn’t been updated since back in the days when Slackware was easier than SLS Linux. That’s right! Slackware was the original Ubuntu. And as far as having the latest software…. I think they only recently went to the 2.6 kernel, which I think every other distro has used for the last five years. And, according to an interview I heard on Linux Outlaws, they are still shipping with Apace 1.3 as the default when Apache 2 is needed for most web projects nowadays. So what are the advantages of Slackware? It’s the most UNIX-Like system. I don’t know what that means – but if you like Unix, you’ll like Slackware. It’s very stable. If you though Debian was cautious – here’s Slackware. Everyone seems to always mention stability with Slackware. Then there’s the vanilla aspect of it. Slackware has a reputation for giving you KDE as the KDE team envisioned it – not as some packager at Canonical or Red Hat envisioned it. For example, Xubuntu has a long bar across the bottom of the screen instead of the default XFCE setup of one small bar on bottom and one large one at top. So there’s room here for Zenwalk to take this great bedrock of Slackware and build upon it to truly make it easy to use. Since the Zenwalk team is using Slackware as its basis, instead of Debian or Fedora, I expect for it to give me all the power of Slackware. I don’t want the GUIs trouncing all over my configuration files. But I do want GUIs if I prefer them. Zenwalk is often touted as a good distro to run on frugal hardware. But, I’m not going to stack it up against the other lightweight distros because Zenwalk was meant to be installed and not run as a liveCD that could be installed if you wanted to. (Although there IS a liveCD version of Zenwalk) One more thing – from what I’ve read about Zenwalk, although it began life as Minislack, it is not a derivative of Slackware in the same way that Ubuntu is to Debian. People can feel free to correct me in the comments, but it appears that it started based off of Slackware and then blossomed up into its own distro. However, it still maintains binary compatibility with Slackware, so whatever works with Slack should also work with Zenwalk. Well, I think that’s enough setup, let’s get this thing installed on Virtualbox. I hit enter. I end up in an ncurses dialog. I went with the autoinstall since I am dedicating the entire disk to Zenwalk. I hit ok a couple of times and the installation begins. Zenwalk then boots up with a nice graphical boot, BUT (VERY IMPORTANTLY as far as I’m concerned) it gives you the option of seeing the verbose output. Ok, so I went into this wondering if Zenwalk could take Slackware’s benefits and then make it easier for the user – after all, if it couldn’t do that then why not just use Slackware? So for the install, I have to say that it was a very easy install for a Linux vet. 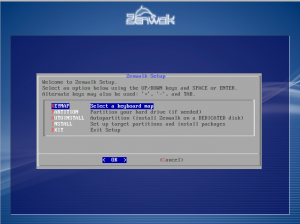 I think anyone that’s done more than one Linux install could install Zenwalk easily. Even for a first time install – there wasn’t anything in there that was any more technical than what users get asked in any other Linux distro. It just loses points for not explaining things as much as others and for not being pretty. I was thinking today of how stupid it is that people call distros non-user friendly just because they use ncurses. As long as it’s asking the exact same thing as a GUIfied install, what’s the big deal? Well, now it’s time for me to log in. So they use a nice littel informative display instead of the default Xfce rat. It gives the user an idea of what’s going on and why they can see their desktop, but not yet use it. Here’s the screen you get upon first boot. A very nice looking Xfce desktop. I like the background and the icon set chosen. Interesting differences I noticed when compared to Xfce in Fedora: Zenwalk has the program menu in the top left corner while Fedora has it in the bottom panel. Zenwalk only has 2 desktops by default and has the switcher in the top. Fedora has four desktokps by default. I also like Zenwalk’s folder icon set. The title bar REALLY gets on my nerves, though. I don’t know what it is about the shade of blue they’ve chosen along with the black outline on the minimize, maximize, and exit buttons, but it really gets in my nerves in a bad way. Just like Debian, Zenwalk uses Iceweasel instead of Firefox; interestingly, it is version 2.0. I’m not sure if this is because I haven’t updated or if this is as modern as Zenwalk 5.2 goes when it comes to Firefox. Come to speak of it, I have not had any notification whatsoever that I need to update any packages. I don’t know if this is because there aren’t any new packages available or if Zenwalk just doesn’t tell you in your desktop manager like modern Fedora and Ubuntu. I’ll check into that momentarily. Other programs in Zenwalk 5.2 are GIMP 2.4, Geany 0.14, Asunder 1.5 for ripping music, Gnome-Mplayer 0.6.2, Brasero for burning discs, GMusicBrowser for music, IceDove, Pidgin 2.4.2, Abiword, Gnumeric, and a few others I didn’t mention. They really do stick to one program per task for Zenwalk. The result is a neat, if sparesely populated, menu. It says welcome to Netpkg. But that’s it. I guess you click on the pull down menu and then click on the globe icon. But I have no idea. Perhaps with all that empty space under Netpkg it could be communicated to the users what in the world they’re supposed to do. Big fail there. AND I was wrong. You click on the arrow and select your mirror, but THEN you click the little refresh icon next to it. NOT the Earth icon. Any folder with a rotating arrow by it is a category containing updates. If you click on any of them you get some info on the package being updated. However, like Fedora prior to version 8 or 9, there is no mention of why the update is taking place. So, it doesn’t say, update such and such a package for security reasons. So I guess it’s up to the user to know what’s necessary to update and what can wait. To keep it simple, I select Iceweasel 3.0 and click the globe icon. For some bizarre reason you are able to install it without the dependencies. If you did this, it would not work. Don’t know why that’s there. BUT Zenwalk does get easiness points here. Why? Because one of the things that annoys people about Slackware is that installing a package does not also install the dependencies. After this process was over I had Iceweasel 3.0.4. Overall it was a pretty easy process once I figured out what to do. There aren’t any games installed by default, but there are quite a few available in the repos. Blender is at version 2.46. This isn’t too conservative a choice – I think Debian is still on 2.44 or earlier. Fedora, for comparison, is at 2.48. So my conclusion is that Zenwalk is doing a good job at what it set out to do – be an easy to use version of Slackware. When installing packages, it calculates dependencies whereas Slackware does not. While I’m sure I could do it if I wanted to, I did not need to edit any config files in order to get things working. It appears to be a good distro. It didn’t have anything tantalizing enough to make me decide to switch to Zenwalk, but it wasn’t a bad distro at all. I think if I were first getting into Linux and hadn’t yet chosen a distro, I might go with Zenwalk. It appears that it deserves all the praise people heap onto it. If you’re distro-hopping make sure you make Zenwalk a stop on your journey. Will you try Vector and compare it ti Zenwalk ? Yes, I’ve been meaning to try Vector Linux for a while now. I’ve heard very good things about it and the name has always fascinated me. Whenever it appears in Linux Format Magazine, I will check it out. That’s what determins which distros I review. You seem to have found one of the biggest problems with Zenwalk everyone has been complaining about for some time now, and that’s Netpkg. Before it went to the 4.x version it actually was very intuitive and easy to use! Putting it in front of a new user of Linux or someone like yourself coming from another distro with easier to use package managers, it puts a very large stumbling block in front of you, possibly turning new users off using Zenwalk. Even for those of us that have used Zenwalk for a while now, find it difficult and very non-user-friendly! The developer has been unwilling to listen to suggestions though, so I’m afraid it won’t change. Now you do have an alternative package manager to use, called Zendo. Created shortly after Netpkg 4.x came out, it strives to satisfy users, both experienced and new. You’ll have to move to a Snapshot mirror to install it with it’s dependencies, but I’m betting you’ll quickly start to like Zenwalk more after using it! Zenwalk is one of the best distros I’ve used in recent years! With ease of use, installation and package management, especially for dependencies in mind, you’ll be hard pressed to find another Linux distro as stable and reliable! Hope you hang around a bit as the new 5.4 is due out soon, promising to have lots of new things you’ll like! Ease of use doesn’t mean point and click tools. It means “install and forget”. As Paul of absolute linux puts it, in most cases wiping the dust off the server is the only maintenance required. Slackware doesn’t do dependency resolution but this is largely mitigated by the fact that in slackware most software are bundled as single tarballs unlike other distros which bundle the libraries, translations, artwork etc in separate packages (thus increasing the number of dependencies). I am not saying one way is better than the other but just that the slack way has worked for long enough so there are not enough reasons to consider changing it. When I said Slackware was the original Ubuntu, I mean it was the first Linux that was easier to use and it’s what everyone used at the time. Other previous “Ubuntus” include Red Hat, Gentoo, and Mandriva. Well, I never thought netpkg was difficult. Perhaps I used Vector 5.9 long enough while distro hopping that using the package manager with it helped when I moved to Zenwalk 5.2. However, the one thing that bugs me, and still gets me once in a while, is the naming rules for the sources. Snapshot is for testing and Current is for tested programs that work. I still think it would be far better to have named snapshot beta (I think everyone by now knows what beta means, but even if they don’t, why not just call them “mightworkmightnot”) and the other could be “current” or “tested” or could even be “thesework”. I just have a hard time translating snapshot to “WARNING! Beta testing”. I think the best way to look at it is that Netpkg isn’t hard. It’s actually very easy. The best word to use would – unintuitive. If you’ve never used it before, it isn’t obvious what you should do. So I see nobody bothers to read manuals these days. While I found your article interesting and I do agree with you about netpkg being not intuitive, I still think that people put too much emphasis on this, as if they had nothing better to judge distros other than by comparing their package managers… For me, the important thing is how easy to set a distro up without much tinkering – i.e. you want to have a distro that starts and you do not need to do anything to your graphic settings and so on. As for packages, it is one of the packaging rule in Zenwalk that any Zenwalk package must work straight away without user doing any work. (This is one of the reasons why compiz is not included in the official repo.) If you are a student, fine… you can install arch, make your fantastic system, etc. etc. But if you are like me, not much time to play around with Linux (or even to distro hop), Zenwalk is doing pretty good in what it says it does. You make some good points. I just think the updating/installing process should be a tad more intuitive. Thanks for writing a review of one of my fav distros. I actually haven’t used Zenwalk full time since mid 2008 but with the release of 5.4 beta I have reinstalled it. I really like it a lot. It has an excellent XFCE desktop which is my preferred DE. I do recall not liking Netpkg very much but it is fine in 5.4. I don’t know if Netpkg has been updated or I just finally got used to how it works but I haven’t bothered reinstalling Zendo. To me Zenwalk is a nice middle ground between the vanilla Slackware and something big and bloated like the “buntus. The beauty of Slackware is how you can make it whatever you want but Zenwalk takes care of a lot of things out of the box. Thanks for your kind words. Glad I was able to review one of your favourite distros. As you said, it fills a great niche where it is easier to setup than Slackware, but not making all the decisions for you as is done in Ubuntu, Fedora, and Suse.